The concert consisted of four dances, and each dance seemingly of groups of solos. That is, Waring seems to work out individual movement, as a fact of meat or space, and then to use them together as a dance. Waring’s dances are for individuals, and having the individuals performing them together forces a surprising unity, i.e., imaginary bonds, of performance. It is rather like going to a party where everyone has decided to be interesting for a change. The dances were: Phrases (1955), a painfully somber exercise. The Satie piano music does not violate the strict blackness of the dance, even tho it is essentially lighthearted. This dance was, I think, the most group-like of the program. The first movements of Valda Setterfield and David Gordon, in a series of highly stylized, yet completely banal threadings and re-threadings across the central eye of the audience, was finally so beautifully grotesque as to remind one once and for all that dancing is performed with arms and legs and elbows; starts and stops. The dance reduced most movement to essential bone with flesh, but as objects to be canonized. 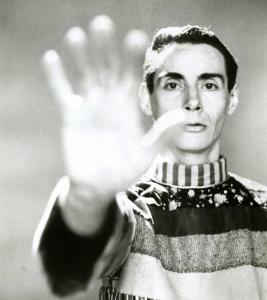 Dithyramb (1961) moved into Mr. Waring’s more recent work, and the group choreographed feeling of Phrases was almost completely absent. The individual solos or separations balanced admirably, even though the dance was sprinkled with single virtuoso precis (even stunts). Fred Herko is a particularly adept stuntman, and a willing virtuoso. William Davis had a grace that was a happy addition to choreography that is essentially hard and edgy. Two More Moon Dances (1961) was a hilarious piece. Remy Charlip’s costumes were wonderfully absurd, especially Mr. Waring’s, which looked as if it had been borrowed from the Wizard of Oz. Valda Setterfield and David Gordon (and Mr. Gordon’s painted mustache) nearly walked away with the whole dance, except that Mr. Waring seemed to be everywhere at once, and Yvonne Rainer his persistent accomplice. This dace was the most “theatrical”, and for this reason lost a great deal of the “pure dance” quality that most of Mr. Waring’s other pieces have. But even the theatricality of this dance was much more sophisticated than the neo-graham school of television soap operas which seems somehow to have gotten rid of any Grahamisms, and Moon Dances has no more relation to Miss Graham and her followers than A Cool Million is related to Amerika. Dromenon (1961), the last dance, was perhaps the most pretentious of the program, but it also was responsible for some unbelievably beautiful dancing by Fred Herko, Yvonne Rainer, and Mr. Waring himself. Toby Armous seem to possess the most lyric quality of any of the performers. She handles her body like an idea, almost effortlessly. Richard Maxfield’s music was quite impressive in this last dance, a piece done with tapes along with live musicians. It was much more than some of the other strictly taped, music concrete sounding pieces, or the willful affectation of George Brecht’s breath-like chatter behind Dithyramb. However, the whole story was Mr. Waring’s choreography and performance, as well as the brilliant performances of his company. It is a shame that we cannot watch Mr. Waring and Co. perform (or the companies of Merce Cunningham or Aileen Passloff or Paul Taylor) more often. Once or twice a year is certainly not enough. Why is it that people like Alwin Nikolais and his original dixieland jazzband are always around, and really estimate performers like Mr. Waring and Mr. Cunningham are not able to appear more often? (A good question, Sam. 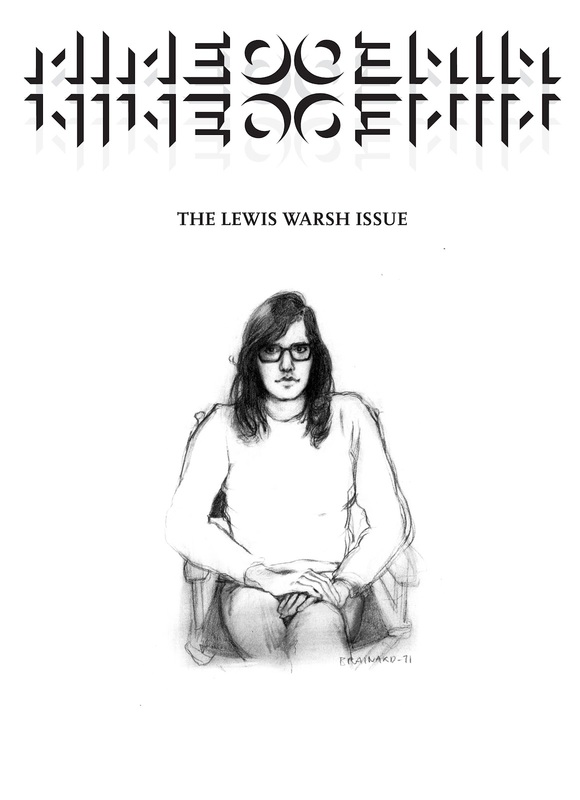 MIMEO MIMEO #7: THE LEWIS WARSH ISSUE is the first magazine ever devoted in its entirety to poet, novelist, publisher, teacher, and collage artist Lewis Warsh. Warsh was born in 1944 in the Bronx, co-founded Angel Hair Magazine and Books with Anne Waldman in 1966, and went on to co-found United Artists Magazine and Books with Bernadette Mayer in 1977. He is the author of over thirty books of poetry, fiction and autobiography, the Director of the MFA program in Creative Writing at Long Island University in Brooklyn, and as you’ll soon discover, so much more. Includes an introduction by Daniel Kane, an interview conducted by Steve Clay, 10 new stories, 5 new poems, dozens of photographs and collages, and an anecdotal bibliography. Please visit Granary Books to see a selection of striking collages and collage books created by Lewis Warsh. 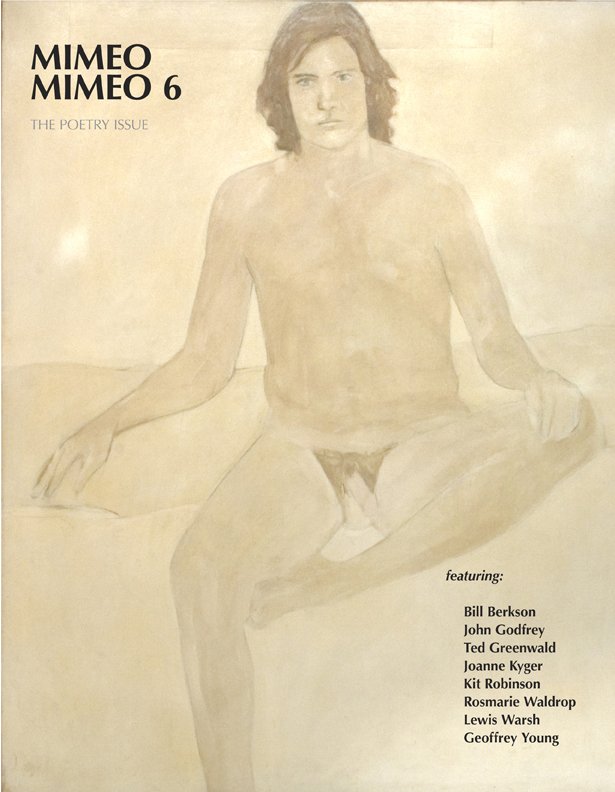 MIMEO MIMEO #6: THE POETRY ISSUE is devoted to new work by eight poets who have consistently composed quality writing that has influenced and inspired generations since the golden era of the mimeo revolution. Contributors include Bill Berkson, John Godfrey, Ted Greenwald, Joanne Kyger, Kit Robinson, Rosmarie Waldrop, Lewis Warsh, and Geoffrey Young. Cover art by George Schneeman. The few copies that remain can be purchased via SPD. 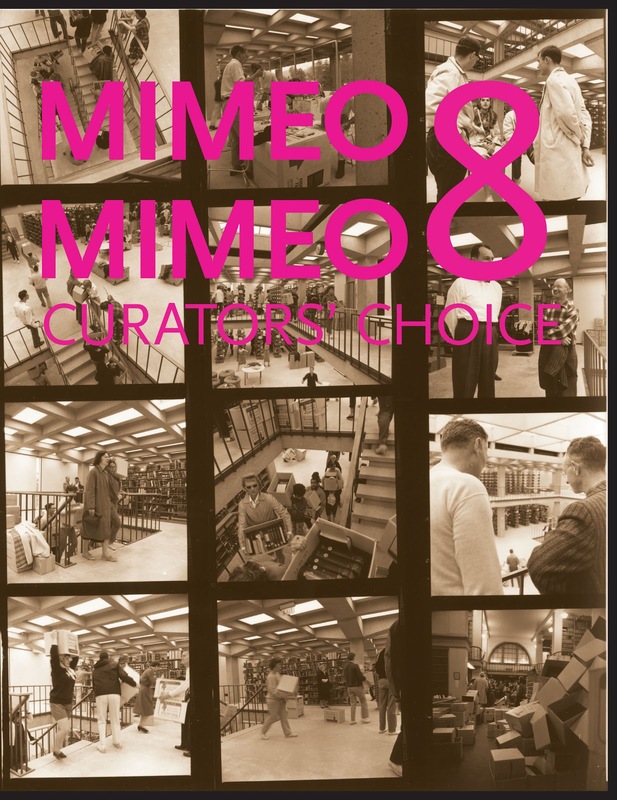 MIMEO MIMEO #5: includes a lost and found essay by Paul Blackburn on the mimeo revolution, Steve Clay on Robert Creeley’s copy of Presences, Michael Klausman on the art of poetry LPs, interviews with Lyn Hejinian and Larry Fagin, Stephanie Anderson on Alice Notley’s CHICAGO, Abel Debritto on Charles Bukowski’s rise to fame, and more. Cover art by Buzz Spector. 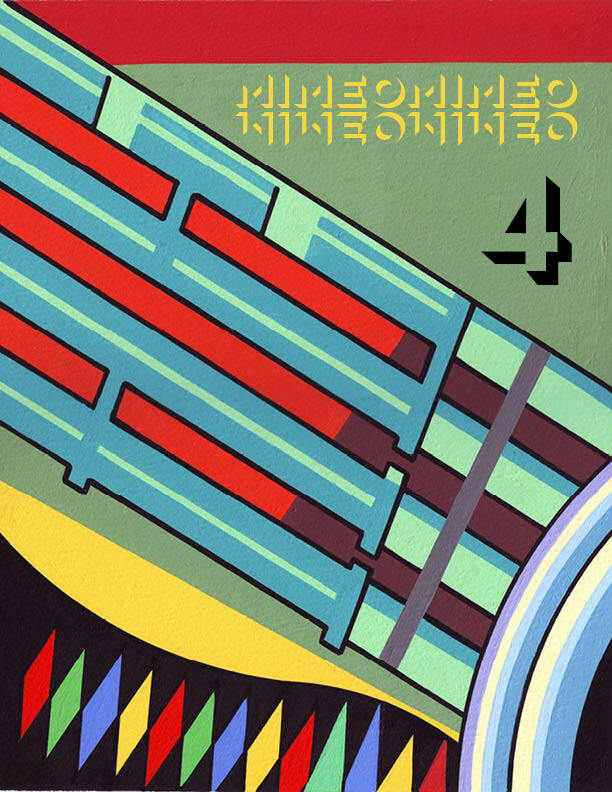 MIMEO MIMEO #4: focuses on the poets, artists, printers, and publications of the British Poetry Revival, a particularly rich period of activity that ran roughly parallel to the New American Poetry of the post-WWII era. On both sides of the Atlantic, the dominant modes of poetics, publishing, and media were being thought anew. Featuring: wide-ranging interviews with Tom Raworth, David Meltzer, and Trevor Winkfield; insightful essays by Richard Price, Ken Edwards, and Alan Halsey; a selection of letters from Eric Mottram to Jeff Nuttall providing a British perspective on the Lower East Side Scene; and a long out-of-print statement by Asa Benveniste, poet and publisher of London’s legendary Trigram Press. The few copies that remain can be purchased via SPD. MIMEO MIMEO #3: THE DANNY SNELSON ISSUE examines the relationship between structuralism and the poetries of the mimeo era by presenting a detailed analysis of Form (a Cambridge-UK magazine published in 1966) and Alcheringa (a journal published by Boston University in 1975), two exemplary gatherings that illuminate the historical, material and social circumstances under which theory informed art (and vice versa) in the early works of some of today's most celebrated experimental writers. Also includes a special insert, The Infernal Method, written, designed and printed by Aaron Cohick (NewLights Press). OOP. MIMEO MIMEO #2: features Emily McVarish on her artist's book Flicker; James Maynard on poet Robert Duncan's early experiences as an editor and typesetter; Derek Beaulieu on the relationship between the influential Canadian poetry journal Tish and Black Mountain College; and an extensive interview with Australian poet and typographer Alan Loney conducted by Kyle Schlesinger. Cover is by Emily McVarish. The few copies that remain can be purchased via SPD. 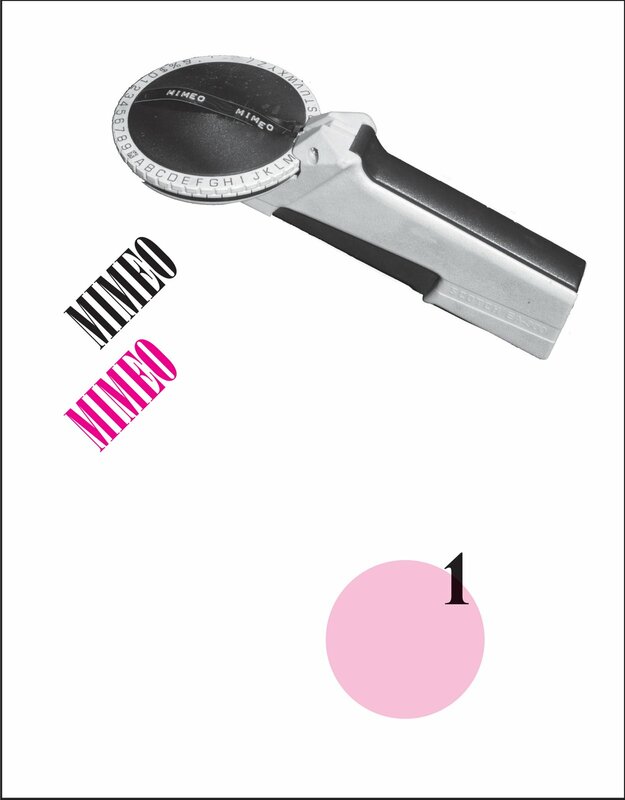 MIMEO MIMEO #1: features Christopher Harter on Midwest mimeo; Jed Birmingham on British poet and critic Jeff Nuttall's My Own Mag; an extensive interview with acclaimed printer, bibliographer and critic Alastair Johnston of Poltroon Press, and poems by Stephen Vincent inspired by Jack Spicer. Cover is by Alastair Johnston. The few copies that remain can be purchased via SPD. If you wish to order multiple copies direct from the press, please inquire about shipping costs. 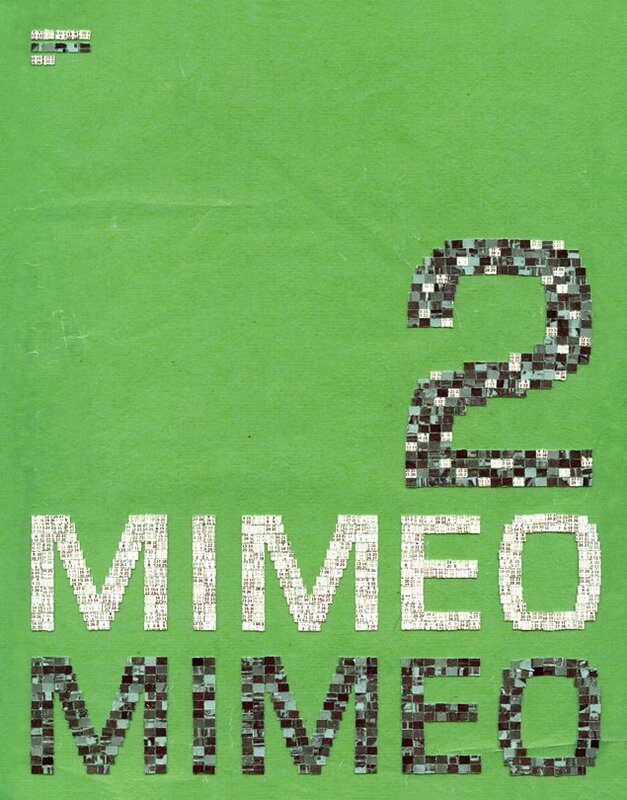 Mimeo Mimeo is a forum for critical and cultural perspectives on artists' books, typography and the mimeograph revolution. 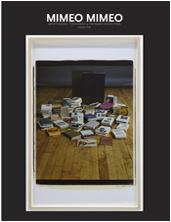 This periodical features essays, interviews, artifacts, and reflections on the graphic, material and textual conditions of contemporary poetry and language arts. Taking our cue from Steve Clay and Rodney Phillips' ground-breaking sourcebook, A Secret Location on the Lower East Side, we see the mimeograph as one among many print technologies (letterpress, offset, silk-screen, photocopies, computers, etc.) that enabled poets, artists and editors to become independent publishers. As editors, we have no allegiance to any particular medium or media (tho Mimeo Mimeo is only available in print at this time). 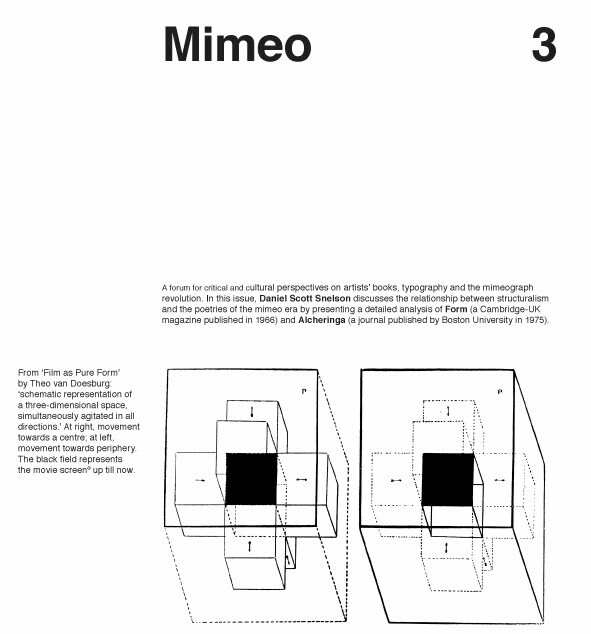 We understand the mimeo revolution as an attitude - a material and immaterial perspective on the politics of print. Threads, a series of talks curated by Steve Clay and Kyle Schlesinger, is devoted to the art of the book featuring poets, scholars, artists, and publishers.